Built in 1931 for Pacific Steam Navigation Company. Liverpool-West coast of South America via Panama Canal. Voyage to Valparaiso in 1936 completed in record 25 days. 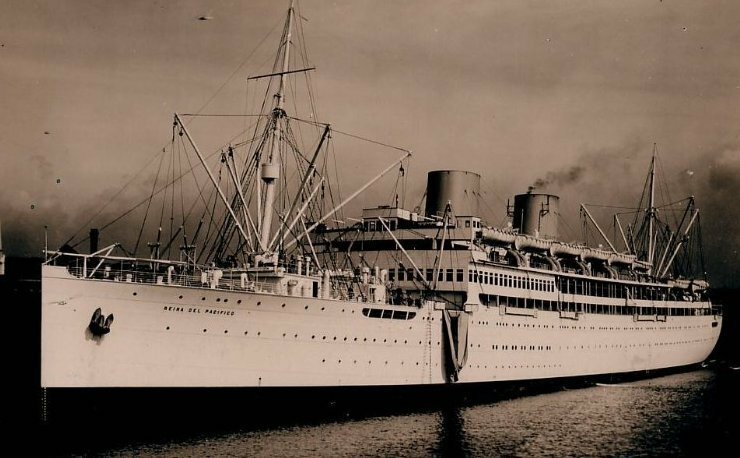 Troopship Duties -1939-46 These included expedition to, and re-embarkation from Norway - 1940. Trips to Suez via Cape Town. Transportation of the 4th Indian Division from Egypt to Port Sudan for the attack on Ethiopia - Jan 1941. Landing craft added for North African invasion, and transported elements of 1st U.S. Division to Oran assault - Nov 1942. Transported elements of 51st Highland Division to landings at Avola, Sicily - Jul 1943. (Excerpts from Carol Cooper's father's diary:-Sunday 26th October: Arrived Liverpool approx 6.30 am. Taken to docks. Saw our ship, the "Reina-del-Pacifico". Taken to transit camp for the night. Monday 27th: Back to ship for the day. Loading etc. Wednesday 29th: Stood out in the Mersey all day. Thursday 30th: Set sail approx 8.30. Due North - 4 boats)Repatriation duties - 1946. Returned to builders for refurbishment - 1947. During sea trials, engine room accident killed 28 personnel - September 1947. Resumed South American service - 1948-58. Scrapped in Wales - 1958.